I shared last week that my little one had terrible colic, acid reflux and milk-protein intolerance, which all started shortly after we brought him home from the hospital. He would scream all the time, for long stretches of time. PoppaNut and I were beyond frustrated — what could we do to help our little angel? He was clearly in a lot of pain and nothing we tried seemed to help. I decided to think of Reece as my Rubik’s cube. “I will master you before my maternity leave is over,” I proclaimed, as I scoured the internet for hours each day. I’d make a list of products to try, products that other mothers were swearing by, and I’d head right to Walgreen’s. We tried Colic Calm, Mylanta, gas drops, gripe water, fennel seeds … you get the idea. I’d hear a mention of something I hadn’t tried, and I’d run right to the store to buy it. With each purchase, I’d come home all excited to give a whirl. And I’d notice some relief, and the happy dance would start. Then, four hours later, I’d retire that product to my collection of “didn’t work after all” buys. We reached out to all of our friends who had similar experiences for sanity tips and home remedies, but we couldn’t quite figure out that right mix for Reece. We also played the formula rotation, trying to find that perfect mix. Reece was terrible during feedings, frantically moving his head from side to side in pain. His belly would rumble, and you could just tell this wasn’t working for him. So, we tried every formula known to man … again, excited each time we tried one, thinking we were closer to a solution, and then it would end in disappointment when the screaming would start again. A very good friend said, “Once you figure out the right combination for him, this will all go away.” I’m no doctor, but that’s exactly what happened. 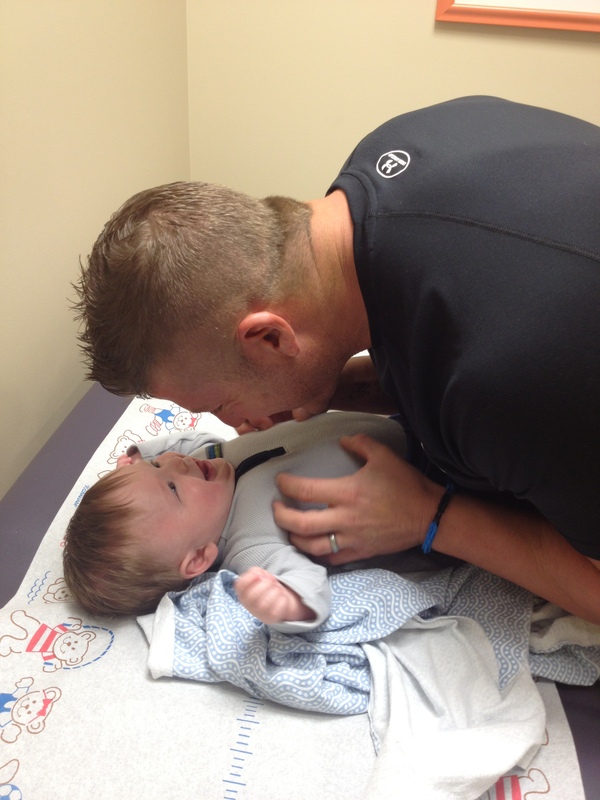 Reece needed a combination of medication and specialized formula with gas drops, and he was a happy baby again! It didn’t happen before my maternity leave was over, but it was pretty darn close. But, as you can guess, that specialized formula isn’t cheap. My insurance wouldn’t pay for the $45-a-can formula, and while I considering selling my non-vital organs to the black market for formula funds, I luckily found an alternative means. A found a blog that outlined the process — find a durable medical equipment supply company (DMEs) that carries your formula (ours was EleCare) and takes your insurance, and you’re golden. You’d think your insurance company would just give you a DME list, but why would they be that nice? I started Googling DMEs and my insurance company, and I found an excel spreadsheet. Then, I took to the phone lines, calling each one tirelessly. I finally found one, and I had Reece’s GI doctor submit a prescription … and just like that, they sent me out two cases of formula! When I got the call confirming my address, I jumped up and down like I won the lottery … and I did — at least the formula lottery! I learned two really important things through all this. One, you are your own health-care advocate, and that’s true for your child as well. PoppaNut and I were told so many times that everything was fine with Reece but we knew there was something wrong. We had to keep pushing for answers until we got them. I encourage you to do the same when it comes to your health or your child’s health. Two, insurance doesn’t make it easy. You have to fight for it. I’m still talking to insurance about reimbursement for Reece’s medication, filled nearly five months ago. But I think they know now I won’t give up now! Whew! I’m glad u figured out how to help! A mama’s always gotta go with her gut! This sounded like our story 12 years ago. We would rock Bella in a rocking chair with the blow dryer in one hand and her in the other. That was the only thing that would calm her. Once we got her on zantac and elevated her crib it was so much better. Your son is beautiful and all this is just a blink of time. Awe, thank you for your kind words … and for your interest in my posts. Our son had reflux and it was so challenging! It’s amazing that you were able to get formula! (We were able to manage our little guy’s discomfort with medication and a sensitive formula, but luckily it wasn’t the uber-expensive type!). Yes, mothers with acid-reflux babies certainly have a lot to bond over. Thank you for your interest in my posts!